The group of men entering the synagogue at Terni caused murmuring among the Jewish men and not a few of the women. Everyone’s hearts sagged with news of the fall of Jerusalem and the destruction of the Holy Temple of Hashem by the Romans. These men had been there. They were refuges forced into the diaspora. How long had it been since any of the Terni Jews made the journey to the Holy City to offer Korban to Hashem? I wrote this for the What Pegman Saw writing challenge. The idea is to take a Google Maps street image and location and use them as a prompt for creating a piece of flash fiction no more than 150 words long. My word count is 150. Today, the Pegman takes us to Terni, Italy. Like most places in Europe, Terni has a rich history going back to ancient times. Wikipedia says Terni was founded around the 7th Century BCE and was conquered by the Romans in the 3rd Century BCE. I have no idea if in the late First Century CE there was a Jewish population and a synagogue present, but I pretended there was. After the Romans destroyed Jerusalem and the Holy Temple in 70 CE, there would doubtless have been countless Israeli refuges who were forced into the diaspora (exile among the nations). 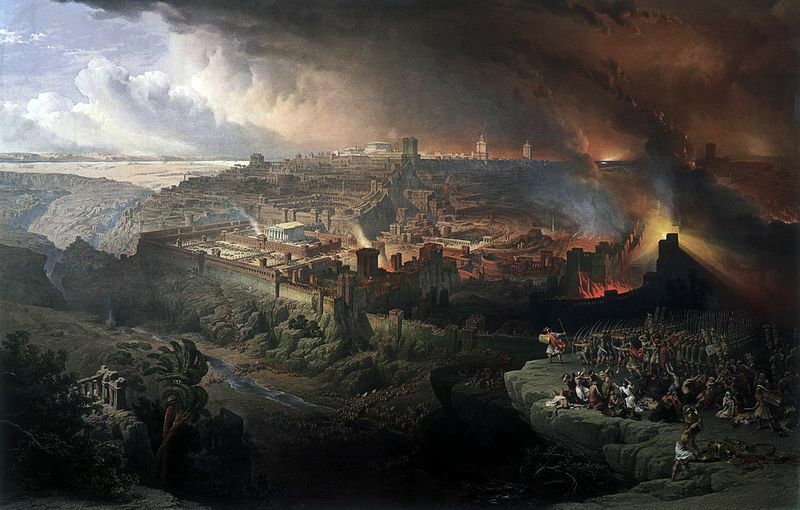 The Jews who had long lived in the cities and nations in the Roman empire would have journeyed to the Holy City only rarely because of the distance and difficulty in traveling in those days, so seeing a group of their Hebrew brothers arriving from the recently destroyed Jewish capital would have caused quite a stir, but there’s more than that. It is a common belief in Christianity, Judaism, and even among other religions and in atheism that Jesus and then the Apostle Paul created a new religion called “Christianity” and converted many Jews and many more Gentiles to it. It is often thought that the Law (Torah) and all of the Jewish customs and traditions mandated by God were “nailed to the cross with Jesus.” My studies have convinced me that nothing could be further from the truth for the Jewish people. The group of men from Jerusalem in my story are devout Jewish followers and disciples of Yeshua (Jesus) the foretold Maschiach (Messiah) and many witnessed him after the resurrection and then they told many others. I borrowed a bit of Acts 13, specifically verses 15, 16, and 23 to put words in the mouth of my fictional Yochanan (John). Although Jewish devotion to Yeshua eventually fell away, we are unsure of just how many years or centuries such Jewish faith in him continued, perhaps even into the 3rd Century CE and beyond. No one knows for sure. However, that devotion would be a wholly Jewish extension of Pharisaic belief, not something that had no resemblance to its root source. That’s what I tried to communicate in 150 words. For the sake of my narrative, I used a classic painting of the siege of Jerusalem above rather than an image associated with Terni, Italy. That troublesome regaining of the Throne of David. King James’ scholars conveniently rearranged the Old Testament so all the prophesy seems to point directly at Jesus, instead of at a Godot-like savior who never shows up. I had to look up Waiting for Godot to understand your reference. Great imagining of St John evangelising the Jews of Terni. I love the way you’ve put together the scriptural quotes. Really nice story, James. I didn’t intend for my Yochanan to be the John who was the Gospel writer. It wasn’t an uncommon name, so there could have been a lot of them among the Jewish Messianic believers. On every Shabbat, after the readings from the Torah and the Prophets (which continue to be the tradition in modern times), any guests in the synagogue were offered the opportunity to stand and make a commentary. You’d have to read all of Acts 13 to get Paul’s argument for Yeshua being Messiah, but even that was a summary of whatever full statement he probably made. Having only 150 words, I had to improvise heavily. Thanks, Penny. Excellent storytelling. You had me convinced it was real until I read your explanation. Who’s to say this event or something close to it couldn’t have been real? Though I liked your story, in this case it was the painting you selected which captured my interest. The artist must have begun from an on-site image, at least a photograph, because a portion of the terrain and the city wall appeared to be quite accurate (though the coloration seemed off). There are also however, alterations whereby the artist inserted features that never existed in order to depict the scene and story he envisioned. I’ve now read this three times and have at last decided on a comment. I find much mystery and trepidation in your story. Well done. Raised Catholic, it is always hard what to take away from the Bible, and what might be “real” and what could be “blind belief.” I’m sure that is a common thread in all religions. I have a “sister blog” where I write extensively about theology and I’m published seemingly endless essays about how the schism between the Jews and non-Jews in the “Messianic devotion movement” (for lack of a better term) resulting in the far more numerous Church significantly rewriting Biblical interpretation to minimize the centrality of the Jewish people and Israel in God’s covenant promises. That’s why studying is so important. Faith doesn’t have to be blind, Alicia. I can imagine that some of this might be very challenging to read. Nice story, though by the end I was only understanding every second word 🙂 Thanks for the explanation at the end! I thought about defining the Hebrew terms in the afterword but I wasn’t “feeling it” at the time. However, you’re right. Korban: The term is usually translated as “sacrifice” as in making a sacrifice at the Temple, but it’s better thought of as an act where one draws nearer to God (there’s an even longer explanation that goes with this). You who fear Hashem/God: God-fearers. This usually referred to non-Jews who believed the Hebrew God was either the one an only God or a God along with the other Roman/Greek gods. They were allowed to attend synagogue services but had no standing in the Jewish community. Yeshua Ben Yosef: Jesus son of Joseph. Jewish men wouldn’t have called him “Jesus Christ” first of all because there are no hard “J” sounds in Hebrew or Aramaic and also because “Christ” is an anglicization of the Greek “Christos” meaning “anointed one” and an equivalent term for “Messiah” or “Maschiach”. Mikvah: This is a ritual immersion, usually in some form of running water. In the Torah, men and women enter the mikvah under certain circumstances when they need to be ritually cleansed such as a woman after the end of her menstrual cycle. In this case, John the Baptist “mikvahed” people in the Jordan river who were repenting of their sins. Teshuvah: Repentance. Implies turning permanently turning away from sin and toward God. Goyim: Non-Jewish people. An individual Gentile would be called a Goy. Cool, thanks! I’ve heard one or two of the terms before but not really understood. Unless you spend a lot of time using the terminology, it won’t really stick.